Rep. Maxine Waters (D., Calif.) is slated to pay her daughter another $108,000 for running a lucrative campaign operation that pulls in hundreds of thousands of dollars each election cycle, FEC filings show. Karen Waters, the daughter of Rep. Waters, collected nearly $650,000 to date for running the operation for her mother's campaign. Karen is in charge of a "slate mailer" operation for Citizens for Waters, Rep. Waters' federal campaign committee. Slate mailers, or endorsement mailers, involve a candidate or political group paying for the endorsement of another politician. A candidate pays Citizens for Waters from their own political committees for her endorsement. If a candidate that she endorses does not directly pay her campaign committee, they must credit their own committee with in-kind contributions from Waters. The mailers are sent to nearly 200,000 residents in South Central Los Angeles, an area where Waters holds considerable clout. The mailers contain an "official sample ballot" and brief quotes from Waters about the candidates and measures that she supports. During the 2016 election cycle, Waters' campaign committee hauled in nearly $300,000 from more than 20 payments for slate mailer endorsements. Kamala Harris, the former Democratic attorney general of California who last November won a seat in the U.S. Senate, gave Citizens for Waters $30,000 to appear on the endorsement mailers this past election cycle. Harris previously paid Waters' campaign committee $28,000 in 2010 to appear on the mailers as she was running for attorney general. The Democratic State Central Committee of California and Yes on Measure M, a group that pushed for an interconnected transportation system in Los Angeles, which was ultimately approved with 70 percent of the vote, each paid Citizens for Waters $35,000 to appear on the mailers. A number of judges and California ballot measures additionally paid to appear on the slate mailers. Karen Waters collected $65,287 throughout the 2016 cycle to run the slate mailer operation. Karen, along with her firm Progressive Connections, has received nearly $650,000 in payments from Citizens for Waters since 2006. Waters' most recent filings to the Federal Election Commission show that an outstanding balance of $108,952.15 is owed to Karen Waters. When Karen is paid the money that she is owed, she will have pocketed around $750,000 for running the mailers for the campaign since 2006. Karen ran the operation from a state committee called LA Vote prior to the 2006 cycle. 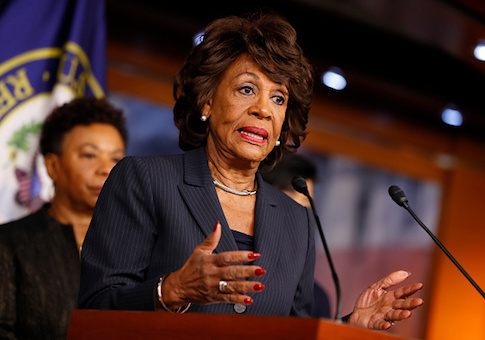 The FEC issued an advisory opinion in 2004 that allowed Waters to run the operation from her federal campaign committee. Waters' office did not return a request for comment on the payments by press time. This entry was posted in Politics and tagged Kamala Harris, Maxine Waters. Bookmark the permalink.